At Todd Photographic Services, we make our customers happy. Word of mouth can be the best marketing tool or the worst and we're proud to count word of mouth as one of our most successful marketing tools. We ensure happiness with every job; if our customer isn't happy, we'll make him happy. You'll never pay a copyright or rush charge at Todd Photographic Services. Add that to our competitive rates, and you've got a partner that saves you money and makes your company successful. 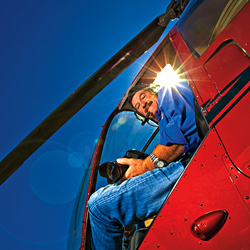 Jim Todd started Todd Photographic Services in 1990, a tiny startup born in a spare bedroom and an overfilled garage. His premise was simple: keep prices reasonable, keep service responsive, focus on the customer, and do work you love. It's been a winning equation for more than ten years, and Todd's reputation is keeping the dream alive. Since 1990, Todd Photographic Services has expanded in staff size and in services, becoming a "One-Stop Shop" for all things visual, but the philosophy remains the same. Todd's partnership with construction companies, realtors, brokers and other development companies continues to be a cooperative one; Todd's photography helps to sell land, developments, and other projects. "You have to see the piece of land before you buy it," says Todd. "I have a unique talent with photography, and I want to help people sell real estate." "Your most important goal has to be making your client happy — no matter what." Todd Photographic Services is an Arizona institution, serving the professional needs of our many clients since 1990. Many local and national businesses have used our aerials and land-based photographic services in that time, including developers, home builders, real estate professionals, brokers, management firms, and construction companies. We create aerial and ground imagery for civic, development and real estate communities across the nation; our impressive capabilities present your project in the best light. Your photography is our specialty. Do you need quick turnaround? High-quality large-format prints? Brochures, videos, aerial shots, interior photos? We've got you covered for these needs and more. Todd Photo is a small company, with responsive small-company service. We're not in the photograph-taking business; we're here to help our customers reach their goals. Come see the difference talent, expertise and hard work can make!